Post: Gaurav Akrani. Date: 9/07/2010. Comment (1). Label: How To. A summary is a short statement or statements that give only the main points or core information of something excluding redundant information. Basically it reproduces main points of a speech, article, section, chapter or book. It does not strive for the style and tone of the original. Today's work culture ultimately requires summary writing skills to save time, money and energy as use of summarized versions in a business organisation is essential at various stages. Thus, today candidates with adequate summarization skills are in great demand for employment. 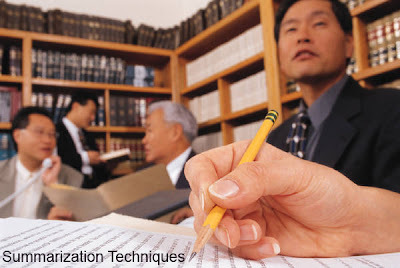 Summarization is a skill and requires proper guidance, constant practice, special efforts and proper training. An abstract is written by an expert for experts. It presents specific analysis, whereas synopsis is brief account of research or business proposal and an outline is primarily a sketch presented professionally. These types of writing involves summarization skills. While writing summary one has to remember that he or she is not directed or allowed to mould, alter or change the main idea and introduce new ideas. Thus, summarization is a process that requires careful attention. An engineer may be asked to submit a 10 minutes summary of 10000 pages long proposal. To present such a report in stipulated efficient time summarization skills acquired. Use perfect reading skills : As cited earlier, reading is a skill. If proper steps are taken, it will remain multi-beneficial. It also plays vital role in summarization skill. In the process of summarization, it helps to segregate following aspects of reading material. The information of these factors will lead better understanding and select core information to write a summary. Underline or note-down major idea : An important stape in the process of summarization is to note-down or underline major ideas during the reading stage. It helps to collect and reproduce major ideas while writing summary. This stage requires best selection and perfect analytical skills. The wrong selection will be futile and create chaos. The notes taken or underlined segment will become the base of a summary. Check for appropriation : After collecting (i.e. noting-down) major points, summary writer is directed to check for appropriateness of ideas to be reproduced in the summary. If proper steps are not taken, the collected points may misguide and not help to reproduce the perfect summary. Prepare the first draft : Next important step in summary writing is the prepartion of first draft. In this stage try to frame simple, self-dependent, short sentences and club points to develop logical link. This draft must be a complete, candid and include maximum points. Enough care is required to avoid needless repetitions and omit examples, anecdotes, and other redundant data.lt is also essential to develop structured paragraphs during this stage. Tailor and limit your summary : First draft always requires proper brush up and improvements. Hence, it is essential to check for perfectness. During this stage it is recommended to check for complete package and logical arrangement It is recommended to select and reproduce theme and meaning or message of the story, table or statistical data, use your own language and active voice. It is also essential to write objectively and insert link between each segment with the help of words such as, therefore, because, as, neverthless, however, on the other hand, such as and others to write a professional summary. It is also essential to adjust length of summary. It must not exceed ⅓rd of the original text. There are three important summarization techniques. They are selection, rejection and substitution. They are discussed hereunder. Selection : Selection is an important summarization technique. It is essential to select major idea, key words and phrases, special terms and interpretations presented in the original resource.These aspects must be considered seriously while writing these summary. It is an important summarization technique as it helps to include all major ideas in summary. Rejection : Rejection is an important summarization technique. lt is a process of removing unnecessary data. As cited earlier, try to reject repetitions, examples, illustrations, anecdotes, redundant, expressions, tables and statistical data. Basically rejection helps to prepare a perfect summary. Substitution : It is also an important summarization technique. Basically it includes synthesis. It is a mode of combining several sentences into one sentence. It is recommended to use sentence substitutions, short sentences to replace lengthy sentences. Use of one-word substitutions is an added advantage in the summary writing process. Be careful to select the theme of passage or reading material. Do not reproduce sentences from original text. Do not provide scope for ambiguity. Be objective and write summary in third person. Do not include any redundant data. Do not criticize or change the original source. Limit your summary, it must not be more than ⅓rd the length of the original passage. Prefer short, simple and self dependent sentences. Avoid cluttering, pleonasm or redundant phares. A summary presents main ideas of given passage. The objective style is used to write a summary. A perfect summary is useful in todays professional era. Summary : Giving main points of some resource. Synopsis : A summary of a piece. Excerpt : A short piece of writing taken from a longer source. Synthesis : The act of combining seperate ideas, beliefs, etc. Rejection : That something cannot be used or sold because of something wrong.